A single phase 200 amp welding machine. 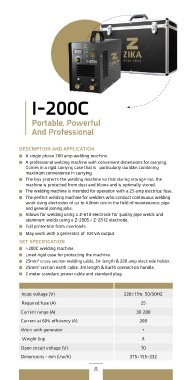 A professional welding machine with convenient dimensions for carrying. The welding machine is intended for operation with a 25 amp electrical fuse. aluminum welds using a Z-2805 / Z-2812 electrode. May work with a generator of 10KVA output. 25mm2 cross section welding cable, 3m length & 200 amp electrode holder. 25mm2 section earth cable, 3m length & Earth connection handle.